Right in the centre of France, nestled in the mountains of the Massif central. 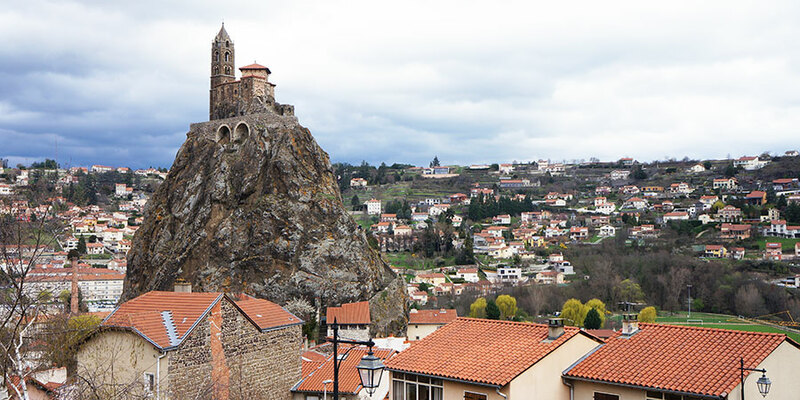 Le Puy en Velay is situated in a large volcano caldera, where two magnificent magma columns can be seen standing at 70 metres over the town. On the top of one of them stands the vertiginous cathedral complete with a giant statue of the Virgin Mary and on the other magma cone, a small church dedicated to St Michael. Pilgrims on the Le Puy Way will start off their journey strong as this spectacular sight is the departure point of this route. 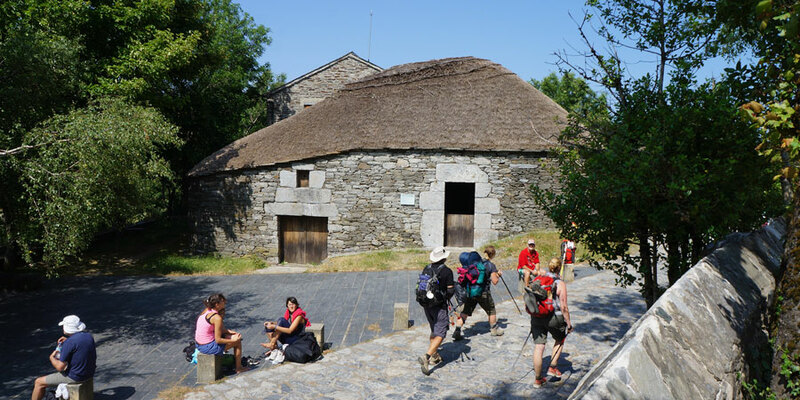 The Portuguese Coastal Way is full of beautiful coastal Camino de Santiago towns. One of our favourites is the tiny hamlet of Oia. This peaceful village contains little else than a beautiful monastery perched photogenically at the coast. The perfect place to relax, put your feet up and enjoy the sunset before continuing your walk towards bustling Santiago de Compostela. You don’t need to travel to Catalunya to get your fill of Gaudi’s unique architectural style. This unassuming little village is home to el Capricho de Gaudi. The house, with its musical windows, watch tower, adorned in sunflowers is akin to an adult playground. Even if Gaudi isn’t your cup of tea the village of Comillas itself is a quaint little treasure characterised by narrow, windy cobblestoned streets, adorable old cottages and no shortage of places to stop for a tortilla, coffee or a glass of tinto. The village of Comillas features on section 3 of the Northern Way. Situated at 1,300 metres of altitude, between the mountain ranges of O Courel and Os Ancares, lies the tiny mountain village of O Cebreiro on the French Way. The village is home to traditional mountain dwellings of pre-Roman origin, called ‘pallozas’. These unique homes can only be found in this region of Galicia. These circular shaped dwellings with their thatched roofs give visitors a unique insight into the lives of local residents back many centuries ago. We finish our post with a visit to ‘the end of the earth’ on the Finisterre Way. With names of such intrigue as ‘the coast of death’ and ‘The virgin of the boat’ it’s hardly surprising that the fishing village of Muxia is simply brimming with legends and tales to tell. With arguably one of the most dramatic pieces of coastal scenery in Spain as its backdrop, it’s easy to see the allure of Muxia and why it brings so many pilgrims to its rocky shores each year. 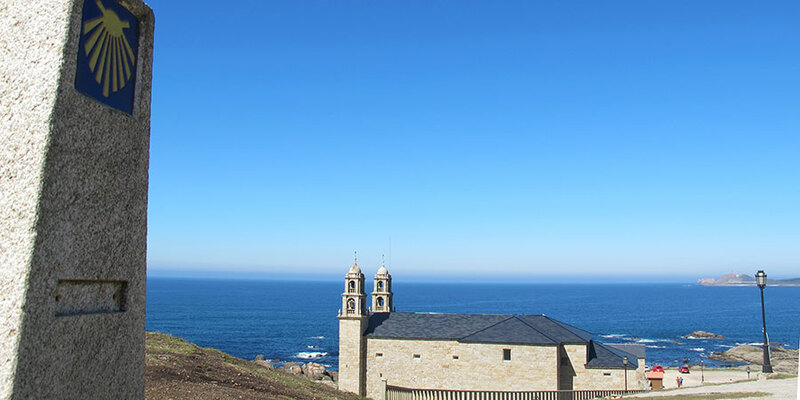 The Finisterre Way, which ends in Muxia is the only Camino route that begins in Santiago de Compostela. For those who dare to brave the 74km road from Santiago to Muxia’s perilous coastline, a special certificate can be received, known as a ‘Muxiana’. Fantastic! thanks for sharing Bernardine, some spectacular towns on the Le Puy route, have an amazing time! Thank you for sharing your tips, Jan! For those doing the way between Fisterra and Muxia, don’t miss the large Praia (beach) de Rostro between Fisterra and Lires, for me the most beautiful unspoiled beach I have seen in Europe! Two locations I can abolutely recommend are Leon, one of the main main cities on the Camino, and El Acebo (right before Ponferrada), which is a magnificent small old mountain village, where you can feel the real pilgrimage vibes. Castro Jerez was amazing setting and convent there with enclosed order was so peaceful. Stayed with Australian Lady in house she had purchased following her own Camino!! Scenery from castle out of this world! !